This new manriding and ventilation shaft was completed around 1919, although from reports in the Derbyshire Times it appears that work started prior to, and was possibly abandoned at the outbreak or during the First World War. Sited at Doe Lea Bridge as an improvement to the ventilation system in the Top Hard seam workings at Markham colliery. It would allow for quicker inspections of the workings by the deputies, it would also seem that the coal it was to mine may have been taken by Ramcroft colliery owned by a subsidiary of the Staveley Company who owned and operated Markham colliery. 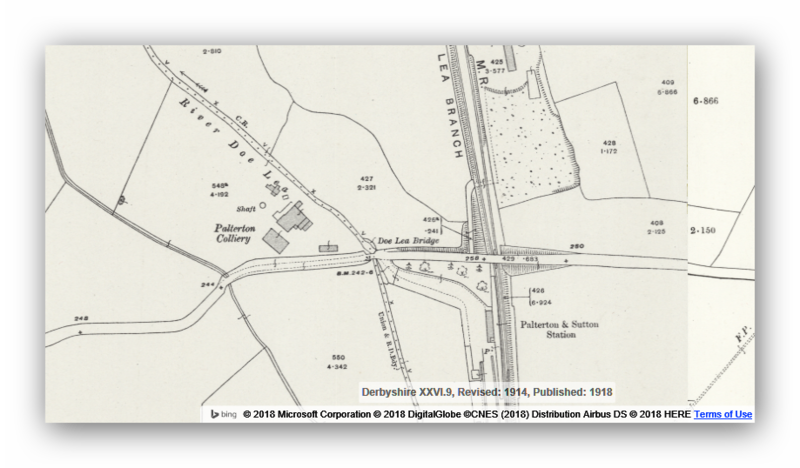 A small amount of coal was removed from the pit bottom area in that seam and the roadways to Markham and Bolsover were linked but the main use of the shaft was to speed up manriding to the workings and improve the depleted air supply to the seam. It was also suggested that an agreement be entered into to pump the water from here to and then up from Bolsover colliery although I suppose it would have been an easy matter to pump out and deposit the mine water into the river Doe Lea nearby. When the shaft was sunk it came across the following seams. High Hazels 639 feet. 41 inches. First Saint Johns 765. 31. Second Saint Johns. 806. 18. One can only postulate on the fact that the shaft and winder there were referred to as Markham Number Five, were there ever plans to expand Markham Colliery with the building of a rail link and washery plant or was it to become a new separate colliery? Although Ramcroft colliery seems to have taken the coal from this area it was a sister pit owned by a sister company of the Staveley company and there had been some problems in the past between the Staveley company and the Bolsover company over the safety issues in this particular area of the pillar of coal which was protecting the Bolsover colliery workings from the water contained in the workings of the collieries to the west of the river. To add to the speculation that a newer bigger colliery was planned in 1918 the following is from the list of working mines in the area. Palterton Colliery at Palterton owned by the Staveley Coal and Iron Co. Ltd., of Chesterfield employed 821 men underground and 22 on the surface. The manager was W.R. Wilson and the undermanager was J. Otterwell. Later by 1923 it is Markham No1 and Palterton employing 353 men underground and 85 on the surface mining hard and soft coals from the Top Hard seam, by 1938 there appears to be no production at Palterton. According to the plans of the Great Central Railway in the early twentieth century a branch line (one of several planned) was to be run somewhat parallel to the Doe Lea Branch Line on the Sutton Hall side (Arkwright’s land) to link the Markham Junction (old LDECR to Carr Vale) with Glapwell colliery. This would have the result in putting Markham Five or Palterton Colliery in the middle between the Midland and Great Central Railways. It never got built but a branch was constructed by the Midland Railway to link the Doe Lea Branch to Ramcroft colliery, a cheaper alternative I suppose. I have met many miners and their families (Now sadly passed) who remember the shaft being used, one lady told me that her father used to leave his 'Dudley' (water bottle) in the cow trough nearby, overnight to keep the water in it cool for his next shift. Shaft filled in and area landscaped 1981.